Getting to dial tone in a UAX13 is complicated. Once you have lifted a handset and obtained dial tone, most of the hard work has been done and the rest is relatively simple. Getting dial tone involves a line circuit (there are fifty on a rack), a linefinder (eight on a rack), a control relay set and allotter (two on a rack) and a group selector (eight on a rack, each one directly cabled to one of the eight linefinders). This means that a maximum of eight of the fifty lines connected to a rack can make simultaneous outgoing calls. Line circuits not involved in an outgoing call can be used to connect incoming calls from the final selectors. Jumpering. 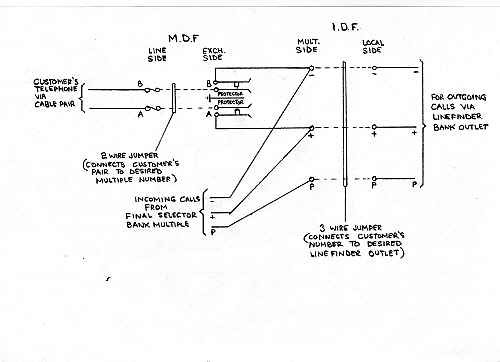 The calling loop is connected to the allocated line circuit via the MDF jumper, which connects the telephone cable pair to the required multiple number, and the IDF jumper, which then connects the number on the final selector multiple to the required line circuit. Standing Conditions When Idle. The L relay feeds a 400 ohm battery on one leg, with an earth on the other, out to the distant telephone. However with the handset on the rest no current flows and relay L is not operated. This battery and earth is also present on the final selector multiple along with a 1300 ohm battery from the K relay. This K relay battery denotes to a calling final selector that the line is free. Incoming Calls. Should the line receive an incoming call, an earth will be placed on the P wire by the final selector which will operate the K relay. The earth also busies the line against any other final selector. Contacts K1 and K3 disconnect the L relay battery and earth and the called line gets its ringing and battery and earth from the calling final selector. This action is sometimes referred to as "removing the bridging conditions". Outgoing Calls When a calling loop is received by the line circuit, relay L operates to the line current. L1 extends a starting battery to the control relay set. Note that odd number levels start control set 1 and even number levels start control set 2. L4 removes the K relay battery from the P wire incoming from the final selector multiple and thereby busies the line to the finals. The allotter will be stood on a free linefinder. Within the control set, relay ST operates. ST2 extends the LK relay via the allotter and the chosen linefinder to a 150 ohm battery in the group selector connected to the linefinder. Note that if the linefinder or group selector are busied by the removal of the red link or are off-normal for some reason, the battery will not be available. If all is well, ST2 operates relay LK. St1 and LK1 hold relay LK and operate relay VR. VR5 earths the -ve wire to operate the A relay in the group selector. A1 operates relay B in the group selector and B5 returns an earth on the p wire in place of the battery. Note that L1 in the line circuit has not only operated relay ST but has placed the marking battery onto the appropriate level of the vertical marking bank. VR1 provides an earth via the allotter to operate relay H in the linefinder to the battery from the rotary magnet. H1 connects the VR1 earth to the vertical magnet self drive circuit, causing the linefinder to drive vertically looking for the marked level. When the linefinder arrives at the marked level, the 150 ohm start battery from the line circuit operates relay VT to the VR4 earth. VT1 disconnects the drive circuit to stop the linefinder going vertical, releases relay H in the line finder and operates relay RS in the control set. H6 completes the rotary magnet self drive circuit via the now operated N1 spring. The line finder drives into the bank looking for the L3 and R1 rotary magnet battery condition on the marked outlet. This condition occurs at the end of the magnet stroke as the linefinder arrives at the outlet. It operates relay H via the 10 ohm winding to the RS1 earth. H6 disconnects the self drive circuit so that the linefinder stops on the marked outlet. H6 also provides a holding path for the H relay to the holding earth on the P wire via the now operated NR2 springs. H4 extends the earth from the group selector M wire back to operate relay P in the line circuit. H5 and H2 extend the calling loop to the group selector to hold the A relay in that selector. H1 provides an earth to short circuit the 6000 winding of the ST relay which releases slowly. P3 releases relay L which removes the start battery condition. P2 operates the Line circuit K relay which in turn at K1 and K3 removes the bridging apparatus and leaves the calling loop through to the group selector A relay. At this point the calling loop is connected to the group selector A relay, which in turn is holding relay B. The P wire has a B5 relay contact earth on it which is holding relay H via its 2000 ohm winding to the rotary magnet battery and is holding relay K in the line circuit via contact P2. 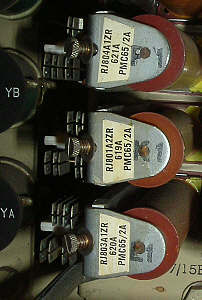 K2 in turn is holding relay P.
Dial tone is being returned from the group selector. This may have left the caller with dial tone, but the exchange is not yet finished. The allotter which allocated the linefinder must now be stepped on to the next free linefinder in readiness for the next call on the rack. 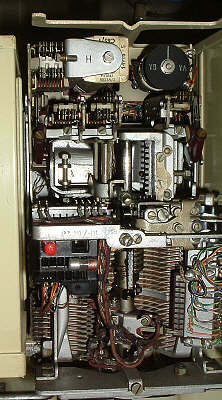 When the caller was found and the H relay was operated in the linefinder, H1 energised the allotter uniselector magnet. This does not step the uniselector however, the step only occurs when the magnet releases as a uniselector is a reverse acting mechanism. The last relay to release in the control set is RS. RS4 releases the uniselector magnet and the wipers step forward onto the next linefinder. Should that linefinder be busy there will be an earth on the A3 bank contact. This earth operates relay G (but not relay LK) and G1 re-energises the magnet. 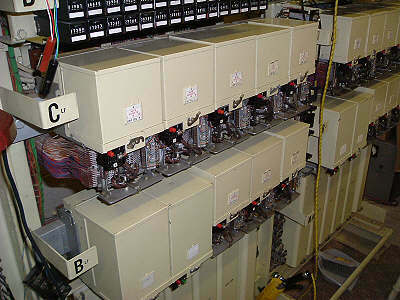 This operates and opens the magnet interrupters and disconnects relay G which releases. G1 releases the magnet which again steps the wipers onto the next outlet. Relay G and the magnet continue to interact and therefore step the allotter on until a free linefinder is found. This will be when the A3 wiper no longer finds an earth from the linefinder. Relay G will not then reoperate to step the magnet further. One other main function needs a little explanation. Should a linefinder not be able to complete the connection to the group selector reasonably quickly, then the start condition is moved to the "other" control relay set so that a second try using different equipment may be made. The "faulty" control relay set and linefinder are then busied out and a lamp lit on the control relay set. When the control relay is started, relay ST operates. 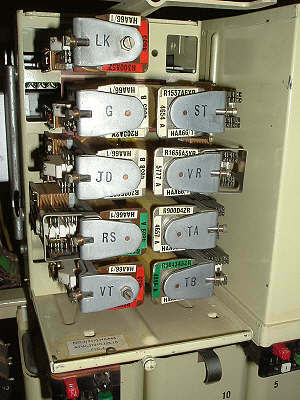 This connects a path for the next S pulse to operate relay TA. Z and S pulses occur, one after the other, every few seconds and are generated by the ringer. Generally, if all is well the call is completed through the linefinder before the next Z pulse occurs and therefore TA will have been released by ST6. If the control set is still being held when the Z pulse occurs, TA2 will complete the circuit to operate relay TB. TB6 holds relay TB to the "other" TB6 contact and lights a lamp on the "faulty" relay set. TB4 switches the start lead to the "other" control set which will attempt to complete the connection. TB4 also releases relay ST in the original control set. TA3 via TB1 puts an earth condition on to wiper A5 of the allotter to operate the H relay in the "faulty" linefinder. H7 replaces the normal battery condition on arc A3 with an earth, thus marking it as busy for future calls. The control relay set, its allotter and the linefinder which failed are all thus busied up. The control set has a lamp showing the condition. All traffic is now handled by the "other" control relay set. The linefinder arrangements have more complications built in to cater for other conditions, but these conditions are unlikely to be met now. Incoming junctions can be connected directly to an incoming group selector which is a simple arrangement. Incoming junctions can also be set up via levels 1 and 2 of the linefinders. However an incoming junction is outgoing at the far end and some time will have been used from the inter train pause for the distant group selector to have found the junction. The call must therefore be set up via the linefinder very quickly. Using levels 1 and 2 reduces linefinder hunting time. A temporary dialling path is set up through the control set should the customer dial before switching has been completed. This prevents dial pulses being missed. These circuit arrangements are not described but can be found in Atkinson's Telephony vol. 2.